Sure, you want to look like a million bucks — but who has a million bucks for one great outfit? A much better idea is to build a wardrobe on a few quality classics: pants that go from day to night and shoes that work as well in the boardroom as they do on the dance floor. Then, punch up the look with some fun accessories that can be trendy without the worry that you’ve sunk your money into the next moon boot. Check out the look below, in cool jewel tones for summer guaranteed not to give you buyer’s remorse. Want to get more great ideas for evening looks? ShopStyle has over 30 pages of outfits for a night on the town that range from everything you’ll need for a simple dinner date or a night of dancing. Have a look you’d like to submit to the contest? Here are the details. 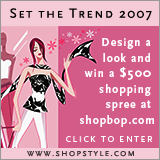 Remember the winner gets a $500 gift card to shopbop.com!